Doweled Corners - Gloss lacquer finish - Ready to hang on the wall! For all your smaller collectibles up to 3/4" thick, use a 2" Collectors Edition Display. 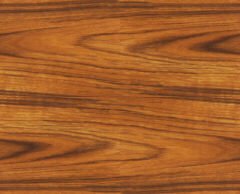 The case pictured here is a 12"x18" constructed from Dark Oak. Sliding acrylic front - 2" Adjustable glass shelves - doweled corners! 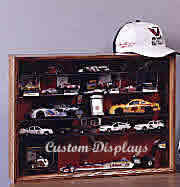 The case pictured here is a 18"x24" Narrow Shelf Unit with four 2" polished glass shelves and constructed from Dark Oak. 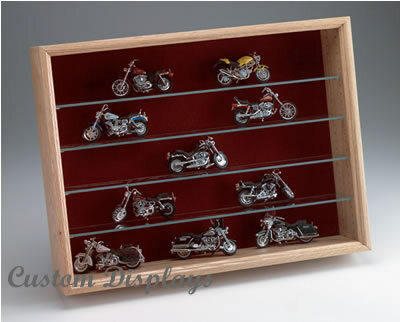 These cases work well for 1/64 - 1/48 diecast or any other item up to 2" wide. Sliding acrylic front - 3-1/2" Adjustable glass shelves - doweled corners! Wide shelf Unit - The case pictured here is a 18"x24" Wide Shelf Unit with four 3-1/2" polished glass shelves and constructed from Dark Oak. These cases work well for all die cast up to 1/24" or any other item up to 3 1/2" wide.